If you read this blog regularly, you know that I like to put things in a positive perspective, even while recognizing the challenging and not so pretty aspects of caregiving and the obvious sadness of grief. After all, the bad feelings are normal and I think that embracing them is healthier than suppressing them. That said, seeking professional help or a support group as a way of dealing with them is something that I have done and that I encourage when you’re beginning to wonder if what you’re experiencing is not “normal” (or at least “normal” for you) and is affecting your ability to function. I take so much comfort and find enlightenment and inspiration from Disney quotes, and they have guided me through caregiving and grief. 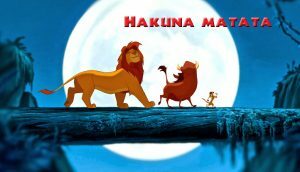 But, there are always times that “Hakuna matata” has eluded me, and I’m feeling that right now. I know, it is a kind of coping skills anthem, but when I am at the height of anxiety, hearing “Hakuna matata” antagonizes me. It makes me want to summon my inner Scar (click here for that post). Last week, I was under the weather with a cold, and maybe that has put me in a funk of sadness and anxiety. Walt Disney said “Why worry? If you’ve done the very best you can, worrying won’t make it any better.” While I can’t argue with Walt, I lack his confidence, and I’ve always worried that my best was and is good enough, especially when I was a caregiver. The truth is, I’m a worrier. I have a good sense of humor about it, acknowledging my need to worry as part of my process for sorting through issues and situations. It has been a while since I’ve felt this down and caught up in worries for days at a time. Feeling ill at least gave me a good excuse to sleep all day. Maybe being home with a cold gave me the time to dwell on things that are unsettling to me. I remembered the many times that Ben would show up at my door with chicken soup and comfort foods when I was ill at home. We always did things like that for each other. What began as a wonder is now a worry if I will ever have that again. I need to remind myself that overall, I have felt like I am making great strides here in the world of the living, coexisting with my memories and the presence of Ben in my life. I am happy at my new school, I see my friends more often, I am frequently at the theater and I even travel. Even though I had some struggles with loneliness during my recent excursion to Washington DC, I am glad that I let myself live that dream of seeing the cherry blossoms in bloom and I continue to marvel at the beauty in the photos that I took, which definitely is something that Ben and I would have done, too. These are new good memories, but they are overshadowed by being memories of myself alone. I feel haunted by reminders that I am alone and I worry that I will always be alone. That set me thinking about how disheartening online dating has been. Will I ever meet someone new, who understood me the way that Ben did? Will I have a future filled with that kind of love? Ben used to love to see elderly couples holding hands and he would say that one day that would be us. As his ALS progressed, we both got emotional when we saw these couples because we knew that it would never be us. I guess I was reminded of that watching coverage of Barbara Bush’s funeral, along with the footage and stories of Barbara Bush and President Bush and their long and beautiful love story. I’m still grateful for the time that Ben and I had and that despite the tragedy, we shared a most special and devoted love in his last weeks in the hospital. Still, we were cheated. Recently, talking about health care proxies and wills got me thinking about how I don’t have children to take care of these things. I have great friends, and I am so fortunate for that, but I do not have obvious answers to these concerns. When should I retire? Where will I live? How will I live? I’m not naïve. I realize that everyone has to make these difficult decisions and think about these issues, whether they are single or a couple or family. I guess my worry sets in when I wonder if I will be making all of these decisions alone. Mary Poppins is right that, “Worrying won’t help anyone.” Still, I worry. I guess I have not yet adjusted to being on my own and yet, I do, intellectually, know that I will be fine. I’m always pleased to share that I have been working through grief and still processing the entire caregiving experience with positive and insightful reflections that are not simply Disney whimsy. But, for caregivers who might feel alone in their setbacks and difficult times, I want you to know that these times happen for me, too. It’s not all “Hakuna matata.” I’m okay with that, as much as I wish I didn’t have the struggles. I think that I understand about myself that worrying has always been part of my way of dealing with things, and sadness is bound to happen. The important thing I try to remember is that I’m living, trying, doing and hopefully, creating or revealing a future that will bring me contentment. I never underestimate the little joys in life, and when I’m ready to get out of the funk, a phone call, email, conversation, and the arrival of spring flowers are distractions from worry that are helping to lift my spirits. And, there’s always pixie dust. 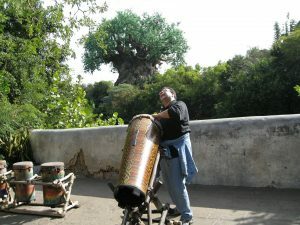 Ben at the Animal Kingdom with the Tree of Life in the background. 2006- pre-ALS, carefree and doing his best Ricky Ricardo “Babaloo” impression.